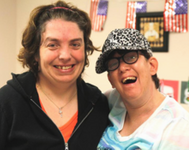 At our Day Habilitation program, individuals with developmental disabilities focus on developing, improving, and maintaining their independent living skills. We do this through classroom learning, community outings, volunteering, and job training. In addition to living skills, Day Habilitation focuses on social and recreational activities as well. Each month we offer a variety of scheduled events including arts and crafts activities, organized sports (Special Olympics), music (Choral), dance, and community outings (dining out, swimming, museums, amusement parks). 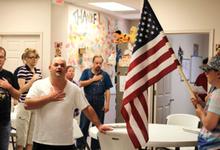 Advantage Care Services provides day habilitation services in San Antonio through our mobile enclave and in the Hill Country, in Fredericksburg at our day habilitation facility. We also contract with many local day habilitation facilities in both areas. The mobile enclave goes out into the community daily volunteering at various organizations, exercising at the park, or participating in social activities in the community. The monthly calendar changes regularly to reflect the interests of the individuals and seasonal activities offered throughout the city. Our Fredericksburg facility is state of the art and easily accommodates individuals of different levels of need, promoting independence to every person’s unique ability. Because we concentrate our services locally, we are very involved in the community and are proud to partner with local organizations.